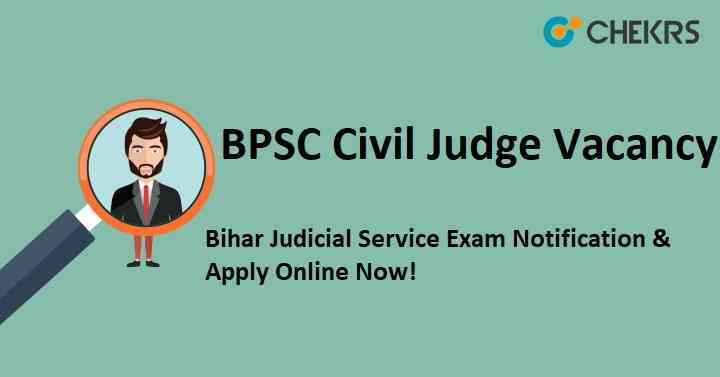 BPSC Civil Judge Vacancy 2019: There is good news for Bihar students who have an interest in judicial service (Government Jobs). Bihar Public Services Commission will be conducting Bihar Judicial Service Examination 2019. Interested and eligible students can apply for the Examination before the last date on official website onlinebpsc.bihar.gov.in. This Examination will fill up vacancies of civil judges in the Bihar Judiciary. Get all the information about BPSC Civil Judge Vacancy 2019 such as the eligibility criteria, syllabus, process etc. from here which is given below in a proper format. Latest Update: The Bihar Public Services Commission (BPSC) has soon published the emplyoment notification for BPSC Civil Judge Recruitment. Interested candidates check the details given below. Eligibility Criteria for Bihar Public service Commission is given below in a Tabular form which makes you easy to understand. A Candidate must be the citizen of India. Candidate of Bihar will get the Reservation benefit. Application form of BPSC Civil judge is available on the official website of Bihar Public service Commission. All the interested and eligible students can fill the Bihar Civil Judge Application Form 2019 before the last date 28 September 2019. For your help, here we are providing all the step that how to apply for the Examination. Firstly eligible candidate open the official website and get the login. After login candidate gets an application form, fill it with care. Attached Scanned Password size photo and Signature with an application form. Now the mode of payment pays the registration fee. Once check all details and click on submit button. To get the success and become a part of the Bihar judicial services commission a candidate have to pass three stages of the UPSC selection process. And the all three stages are given below. Paper will be in Hindi and English. Main Examination will be a written examination. The written examination consists of four papers. The details of all paper are given below in the table. Paper I Hindi 3 Hrs. 300 Marks. BPSC Civil judge Admit Card will be uploaded on the official website before two or three weeks of the Examination. All the candidate who has registered can download their Admit card from the website. No, admit card will be sent by post to the candidates. Different Admit cards will be issued to the students for all different stages of the examination process. Remarks: In our article, we have provided all the essential information for all those candidates who are preparing for the BPSC Civil Judge Vacancy 2019. Candidates if you have any query regarding BPSC service examination, kindly comment below and we will try to solve them as soon as possible.